Nintendo's upcoming console is about as powerful as the Xbox 360 and PS3, according to Darksiders developer Vigil games. There's been a lot of speculation that, like the Wii before it, the Wii U will match the current gen in terms of graphical power rather than try to compete with next generation consoles from Microsoft and Sony. Nintendo hasn't released the full specs for the system, but comments from Vigil Game's Marvin Donald seem to confirm said speculation. 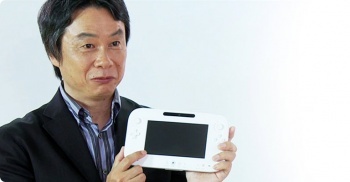 "So far the [Wii U] hardware's been on par with what we have with the current generations," he told Game Reactor. "Based on what I understand, the resolution and textures and polycounts and all that stuff, we're not going to being doing anything to up-res the game, but we'll take advantage of the controller for sure." While It's true that gamers won't see the system's full potential until developers have had a few years to molest its innards with their filthy programmer hands, the Wii U being graphically weaker than its contemporaries would make sense. Despite inferior hardware, the Wii is outselling both the 360 and the PS3, and it's Nintendo's most successful home console to date. This news may disappoint the core gamers that the Wii U is ostensibly aimed at, but on the bright side, this paves the way for all kinds of pithy "duct tape" comments. Enjoy.